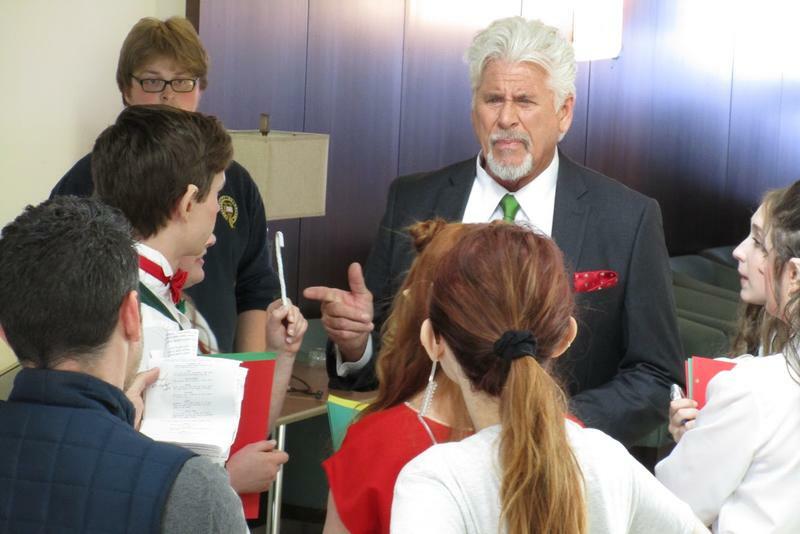 Barry Bostwick reviews lines with his elves. 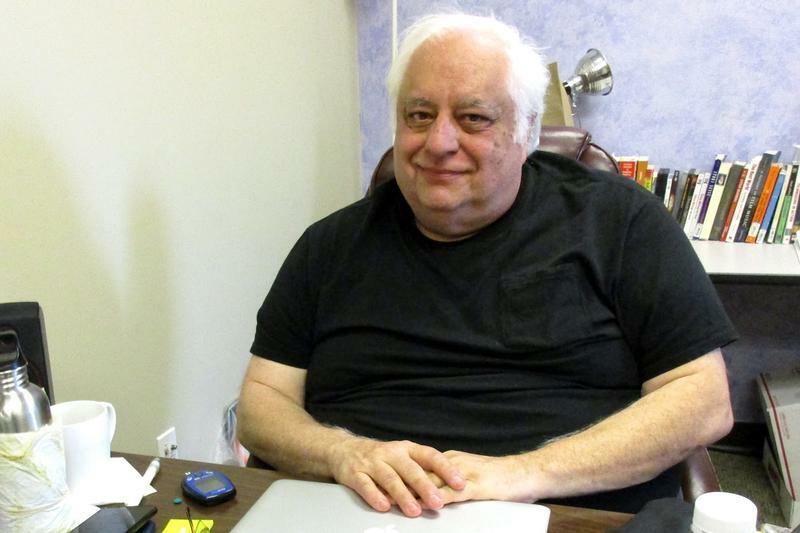 Paul DiFranco is a distinguished adjunct assistant professor of music production and recording technology at Shenandoah University. Jennifer Stone plays Santa’s daughter Cassie in Santa Girl. 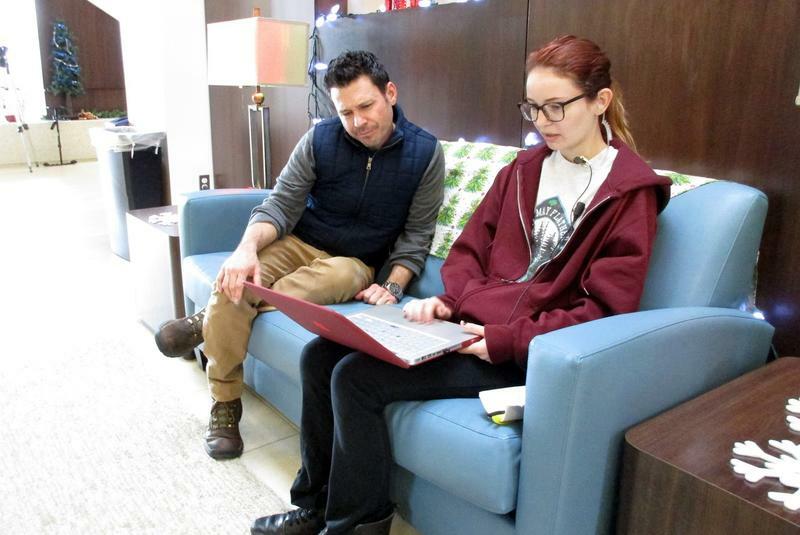 Director Blayne Weaver with assistant Darcy Pierce, an acting major at Shenandoah University. Director Blayne Weaver adjusts Barry Bostwick’s clothing. This fall marks the start of something new at Shenandoah University in Winchester: A partnership between the university and a film and television production company. It’s starting off with the University as the set for an upcoming feature film starring Barry Bostwick and Jennifer Stone. WMRA’s Christopher Clymer Kurtz visited the set for this story. More from there in a bit. First, though, here’s what’s going on, in the words of a key figure in the arrangement between Shenandoah University and Capital Arts Entertainment, Paul DiFranco. He is semi-retired from entertainment — he did a lot of music supervising, among other things — and now is a distinguished adjunct assistant professor of music production and recording technology at SU. PAUL DIFRANCO: I thought I could escape Hollywood by coming out here, and it followed me. Some dear friends of mine said, “Why don’t we make movies together with your students and our money?” And I said, “OK.” How do you say no to that? The idea is for the SU-Capital Arts relationship to continue as part of the university’s film program, which will have a major next fall, he said. This fall’s project is directed by Blayne Weaver. BLAYNE WEAVER: We’re basically making a film here called Santa Girl, it’s a comedy, romance, family movie set in Christmas. Santa Claus has a daughter named Cassie who goes off to college, and it’s kind of a cross between the movie Elf and an episode of “Gilmore Girls,” but hopefully it’s charming and fun and Christmas happy making. Weaver, his producers, and his director of photography are the only experienced filmmakers on site. Aside from a few lead actors from Los Angeles and some local professional makeup artists, everyone else working on the film are 60-plus university students, and faculty and staff. Weaver has written, directed, acted — Can you hear Peter Pan 2 in his voice? — and said that while working around class schedules has slowed things down, he’s worked with inexperienced crew before, so that’s not a problem. While we were talking, it wasn’t a student who interrupted. It was Barry Bostwick, about his cufflinks. Hear Chrisopher's full interviews with actors Barry Bostwick and Jennifer Stone. WEAVER: It is cleaner, You don’t like those guys? BOSTWICK: I think it’s good, but it takes a while to figure out what the hell it is. WEAVER: Alright, let’s change it then. BOSTWICK: What do you think? WEAVER: I defer. I think that’s beautiful, and it’s cleaner. BOSTWICK: The director deferred to the actor. That doesn’t happen very often. WEAVER: When you have Barry Bostwick on the set, you listen to what he says. Bostwick was Broadway’s original Danny Zuko in “Grease,” and is known for his roles in The Rocky Horror Picture Show and Spin City. He said that working with students feels... familiar. BOSTWICK: I feel like I am at home with my kids. I’ve got a 22 year old boy and a 21 year old daughter, and they know the basics of life, and then you just sort of have to sneak in some of the specifics. One very involved student is Darcy Pierce. DARCY PIERCE: Oh my god, it’s the most incredible experience of my college career. I’m a senior, and I get texts from the producers. That’s insane. Pierce is an acting major. She is working as director’s assistant, and she appears in the film. PIERCE: I play Deirdre. She’s a girl that Cassie, Santa’s daughter, meets at college, and is kind of like a bully. 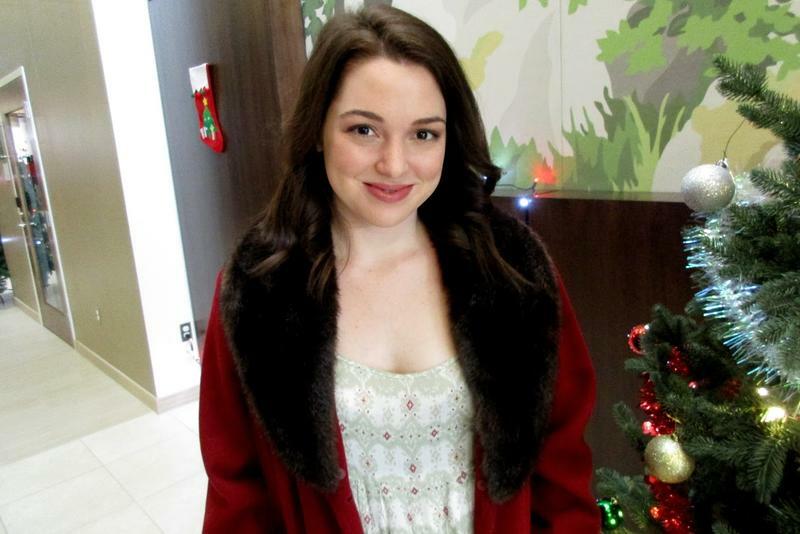 JENNIFER STONE: It’s cool to see the vigor of someone who isn’t been jaded by the business yet. They still have stars in their eyes, and they’ve really gotten into the technicality of it, and they’re really excited about every step of the process. It really allows me to see the details again, and appreciate them all over again, through the students’ eyes. So it’s been really cool. 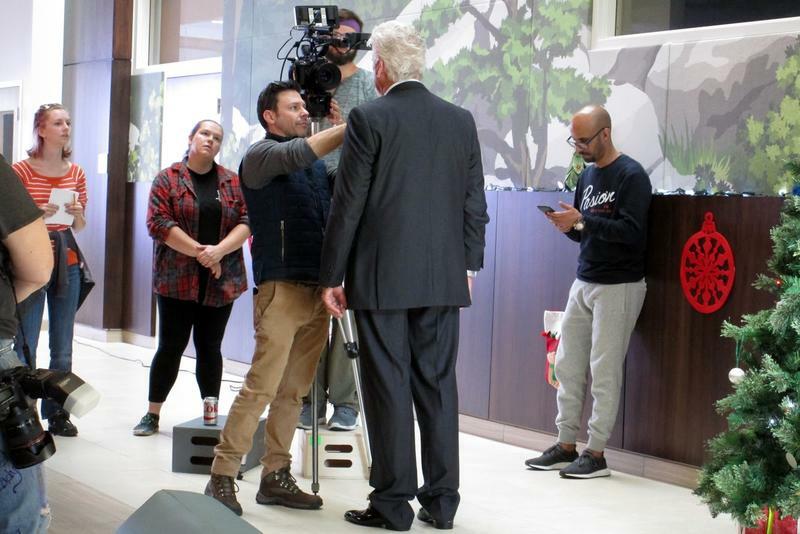 Back on set, Weaver focuses on a rather imposing tall, lean Santa in a grey business suit surrounded by scurrying elves...and wearing red socks. Santa Girl is expected to be released next Christmas .